anyway i wanna hear what you guys have been up to, post about yourself if you remember me because i'll hopefully remember you!!! Everything has changed and nothing has changed. Good luck computering the sciences. How goes the studying? I'm studying CS as well and have been for what feels like forever. Yeah times do change, don't they. I still remember how I found out about this site. Namely because someone on german tv wanted to show Googles "this site does not exist" redirect site or something and typed in asdf.com, assuming a site like that would not exist. That was when I was in 7th grade or so I think. Definitely still school, that's for sure. Hearing so many people here are studying makes me feel like an odd one out, haha. It's funny how people sometimes remember the site after years to be honest. Edit: Now that I think about it... that was back in '11. I was 15 at the time. Now being a 22 sergeant in the army sure makes me think about how fast time goes by sometimes. Are you kidding me, are you saying we were on german television?! everyone gets their 15mins o fame, and in our post-privacy world you mite not even know it. It wasn't for long, maybe 10 seconds or so, but you definitely were on german live television. The TV station no longer exists though, it had been TV station that focused on gaming and tech stuff, but got bought in '08 and closed in '09. And i decided to join up after ghosting this page for 2 years or so I think. It's been a decade so the memories get a bit blurry. Too bad I don't have a clip of the asdf.com visit. I'm around, but not as much as I used to be. I'm working and being a dad, and those two things take up a large chunk of time. That's cool, didn't know that. I'm also a dad and a student, but I still take time to visit, though I don't post much. I still remember when I joined, but I don't really remember how I found the site. I should make more time to come here. At least once a week. That's doable, right? I was sad when I got on and realized that it had been about two months. I was bored one night, and typed ASDF into my browser address bar. 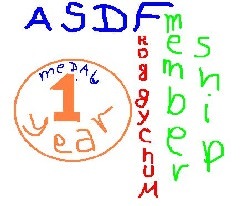 The Google search led me to asdf.com; the rest is history. I am not crying tears, but that was good. I've never played those types of games so I don't think I really get it. That would be less funny if Americans learned how to enunciate properly.